Kachchhara or Ceylon hydrolea (hydrolea zeylanica, family: hydrophyllaceae) is a trailing or semi-erect annual herb with branches. It can get a length of 30-40 cm. By the roots, produced from nodes, it survives on the ground. The branches are reddish and tomentose. 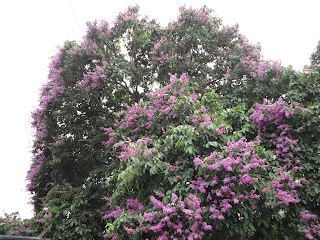 Despite its beautiful flowers, it is still not popular among the gardeners of Bangladesh. Short-petioled leaves are simple, lanceolate, entire. Showy flowers borne in terminal or axillary inflorescence, subsessile. Petals 5, sepals 5, stamens 5. Sepals are lanceolate, pubescent, persistent. Flowering occurs in late autumn to winter (Oct-Jan). Fruit is a capsule, thin, transparent, globose, many-seeded. Propagation is caused by seeds. The plant is often used as fodder. The leaves have antiseptic properties that are used in wounds. The leaves are also used to the treatment of ulcer. It is found in shallow water and ditches and as an weed in crop field throughout the country. The plant is also found in the tropical zones of the world.